About 5 years ago, I was still living in New York trying to complete my degree at the Rochester Institute of Technology. While studying at RIT, I was also trying to balance things out by learning the ropes of DJ-ing and music production. Not long time passed, after I started recording live mixes with some of my favorite tracks at the time. After spending countless hours working on and recording new mixes, I started uploading them to SoundCloud, which at the time was a brand new platform for sharing music. I had a couple of live mixes recorded and uploaded to SoundCloud, when I was contacted by a DJ by the name of Pancho who really liked the tracks and the style of music I was playing in my DJ sets. DJ Pancho reached out to me and suggested that we collaborate and create a radioshow which we could promote and broadcast on national radio station in our home country, Bulgaria. We called the radioshow 'Inferno DJ Show.' We had the first episode produced, so we sent it to Alpha Radio - the most popular national dance radio station back in 2010. Within a month the 'Inferno DJ Show' was approved by Alpha Radio! It didn't take too long for our radioshow to be broadcasted on Alpha Radio. We were happy to have the Inferno DJ Show on air for a full year and a half. Personally, it was one of the best things that had ever happened to me, and I was super excited and thankful to DJ Pancho and Alpha Radio for the opportunity to have my own work broadcasted on national radio station in my home country. You probably wonder why I'm telling you all this! So... As I was trying to prepare and record the very first episode of the Inferno DJ Show along with DJ Pancho, I ran into a remix called 'Time of our Lives' by the infamous at the time producer Deniz Koyu. The first time I heard this remix, I loved it so much so I ended up including it in one of the first episodes of Inferno DJ Show. I liked the track so much that I instantly became a fan of Deniz Koyu's production. I knew back then that he would become one of my favorite producers in the coming years. And so it happened. Through the years, I've been playing his original tracks and remixes in my sets. I've also released mashups which include some of his tracks in the past years. He definitely remains one of my favorite progressive house producers for the past couple of years. And now... 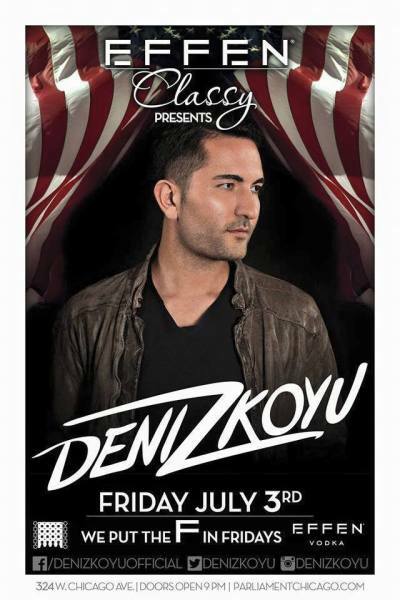 I'm very excited to share the news that I'll opening for Deniz Koyu this coming Friday, July 3rd at Parliament Chicago. Catch my opening set at Parliament (324 W. Chicago Ave) from 9pm to 12:15am. Hope to see you all there! This Saturday, May 17th, I'm playing at Y Bar. It's one of my favorite spots to DJ at because of the venue and the crowd. Y Bar is an upscale cocktail bar and lounge with a great DJ line-up every week(end). I think it's perfect for celebrating birthdays, where people can come enjoy amazing cocktails, listen to great quality music and meet new people. My new website is finally ready. I'm very excited to share new music and mixes as well as blog posts, pictures and of course events where you can catch me DJ at.